Shellac that has gone beyond its shelf life will not come to a cure on your project, leaving you with a tacky mess. So how can you tell if your Zinsser product is good to use? 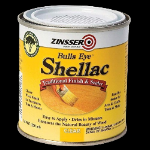 If you are purchasing Zinsser shellac from your local paint or hardware store, Zinsser literature states that their product has a three year shelf life. Before you purchase your next can of Zinsser shellac, take a look at the top lid of the can and check the code. You will see the word LOT. Followed by a letter which identifies where that shellac was packaged. The first number after the first letter is the last digit of the year it was packaged. This is the first thing I look for on all the cans on the shelf! So if the number is 7, that means it was packaged in 2017. Vendors sometimes do not rotate their stock. The second number is the month it was packaged. The third and fourth numbers relate to the date within the month it was packaged. The fifth number or letter refers to which batch of the day the shellac was packaged. Meaning, there may have been five different batches of shellac packaged that particular day. So that can would have a 5 at the end. For those of us who prefer to mix our own shellac from flakes or buttons, shelf has the same concerns. A rule of thumb is to mix as much shellac that you are going to use in the next six months. I have made shellac that has lasted much longer than six months, but I always test it on some scrap wood (that I have sanded) to make sure it is functional. I prefer not to use store bought denatured alcohol for my shellac. Reason being that most denatured alcohols contain methanol, which is used to "denature" ethanol. Ethanol can be denatured with other solvents that are much less toxic. Behlan sells a product called Behkol Solvent and Mohawk Finishing Products sells Shellac Reducer which are both methanol free. If you're near a liquor store that sells 180 proof Everclear, it makes a very excellent and safe way to dissolve your flaked shellac (though I am not responsible for what you do with any leftover Everclear once the shellac is made). Finally, I use a coffee bean grinder to first pulverize my shellac flakes. It really expedites the process of dissolving the shellac. I hope these tips will help you explore shellac finishes with greater success! "That's A Lot to Learn On Your Own!" All wood working starts with a common theme-determine a projects specific function and then create a design to achieve that function. All wood finishing starts exactly the same way-with the project having a function and then a design. The function of the finish is to provide the appropriate level of protection. Different projects (i.e. floors, doors, cabinets, chairs, a jewelry box, a dining room table, millwork) all require functionally different finishes. Choosing a functional finish includes picking the right type of finish and the right method of application. Here are just some of your choices: oils, oil varnish blends, gelled finishes, shellac, lacquer, varnish, urethane, or two-part coatings. Then there are water-based finishes or solvent based finishes to choose from. Application methods include: rags, brushes, rollers or spraying systems. Industrial coatings can even involve ultraviolet curing systems. The design for wood finishing provides its visual appeal. It is the color/visual appearance you want to see on the project. This component is provided by your choices of oils, dyes, stains, dye- stains, or other chemicals. Your approach can range from one-step coloring to a multistep regimen including glazes and toners. Color theory/color matching can play a huge role in creating the right design/aesthetic property of the object. It also plays a large role in the function of a coating by protecting and/or preserving the wood from fading. Where the wood finishing is to be performed must also be considered. Site conditions can restrict the use of certain chemical(s) and or procedures. Spray gun application is an example. No matter if you're a hobbyist or a professional, the goal of an effective finishing regimen is to eliminate as many unnecessary products and procedures as possible while still accomplishing your function and design goals. This allows you to focus on mastering the tools and techniques that are most relevant to your specific needs. At the National Institute of Wood Finishing, I taught thousands of students how to finish wood and I've heard the reports from those who tried to learn it on their own and it generally isn't pretty. Multiple horror stories of failed finishes, missed deadlines and constant frustration. It is no surprise that wood workers often shy away from finishing their own pieces, or worse yet, go ahead and apply a sub-par finish to an otherwise successful project. That's why I believe that wood finishing education is essential. And why I've spent the last 40 years teaching others the craft. With so many wood finishing choices to explore and limited time to learn, what is the right way to approach the subject? The most effective answer is targeted training for maximum effect. And you've got some options. For those of you who are looking for a general introduction to the world of hands-on finishing, I conduct two and five day classes throughout the spring, summer and fall at the Marc Adams School of Woodworking. These are classes with limited enrollment (18-22 students) and include a mixture of theory, demonstration and hands-on time. By the end of my 5-day classes, you'll have learned the why's behind the how-to using many common finishing techniques. These classes are a great accelerated start to the world of fine finishing. For those of you who desire a more targeted approach, the next level is one-on-one instruction with me. These sessions can be one day or several and the subject matter is carefully customized, with plenty of input from the you, so as to specifically address your finishing needs. These sessions typically take place in my shop at Fresh Air Finishers in St. Paul, MN. The peak level of custom instruction involves me coming to you and can be especially advantageous when troubleshooting site conditions or specific equipment. It is often the choice of professional finish shops with multiple employees to train and specialized requirements. I also lecture and consult at locations around North America as well. Hopefully there is an offering above that you'd like to take advantage of. You can begin the process by answering a few simple questions. Your answers help me eliminate what you don't need so we can focus your session to address what you do need. What kind of projects am I constructing? What woods do I typically use? Every species of wood has its own unique finishing challenges! Where are you doing your finishing? Are there specific challenges you are aware of? How are you most likely to apply the coatings? With a rag, a brush or spray gun? Are you interested in learning how important coloring the wood is?